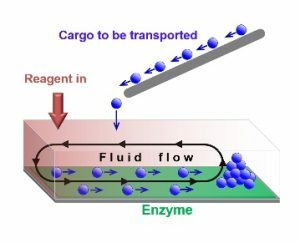 Controlling fluid flow at the micro- and nano-level can enable the development of self-operating microfluidic devices and even small-scale factories that perform chemical synthesis and biomedical assays, as well as drive robotic systems operating in harsh environments. The stumbling block, however, is devising effective ways to regulate the movement of the fluids at such small, confined levels. To find solutions to this challenge, the National Science Foundation has awarded $1.8 million to the University of Pittsburgh’s Swanson School of Engineering, establishing the NSF Center for Chemo-Mechanical Assembly (CCMA). Principal investigator is McGowan Institute for Regenerative Medicine affiliated faculty member Anna Balazs, PhD, Distinguished Professor of Chemical Engineering and the John A. Swanson Chair of Engineering. The CCMA is established through the Centers for Chemical Innovation (CCI) Program, which supports research centers focused on major, long-term fundamental chemical research challenges. Dr. Balazs explained that while mechanical pumps are traditionally used to drive fluid flow, such systems are not useful when designing micro- and nano-fluidic devices that could operate without external controls or power supplies. Catalytic reactions, however, can serve as “chemical pumps” by creating gradients in chemical concentrations and fluid densities that spontaneously give rise to net flows. “Just as a river current carries a pebble, fluid flows can carry particulates such as nanoparticles and microcapsules. Building upon our previous research at Pitt and partner institutions, we have developed novel tools to enable unprecedented control over fluid flow and particle organization in confined, small-scale environments,” she said. “These “catalytic conveyor belts” enable the design of self-powered, self-sustaining systems that organize particles and are capable of performing complex functions, such as delivering significant amounts of particulates to sensors on surfaces and, thus, allowing highly sensitive studies to be performed both efficiently and rapidly, or fabricating complex microstructures and patterned surfaces in solution. Potential applications for this research includes the creation of stand-alone microfluidic devices that autonomously perform multi-stage chemical reactions and assays for biomedical applications; automated materials assembly in harsh environments; and small-scale factories that can operate autonomously to build microscale components for use in fine instrumentation and robotic systems. Also as part of the national center program, the NSF award enables Dr. Balazs to engage in STEM workforce development and public outreach. Funding will support graduate and postdoctoral students, especially those from underrepresented populations, as well as public lectures, hands-on traveling exhibits, and museum and science center projects. Dr. Balazs’ co-investigators include Todd Emrick, Professor of Polymer Science & Engineering and Director of the NSF Materials Research Science and Engineering Center (MRSEC) on Polymers at the University of Massachusetts-Amherst; Ayusman Sen, Distinguished Professor of Chemistry at The Pennsylvania State University; and Howard Stone, the Donald R. Dixon ’69 and Elizabeth W. Dixon Professor of Mechanical and Aerospace Engineering at Princeton University.